Chopped grilled chicken, onion, roasted rice powder and dressed wit lime juice, and topped with crispy Thai Herbs. 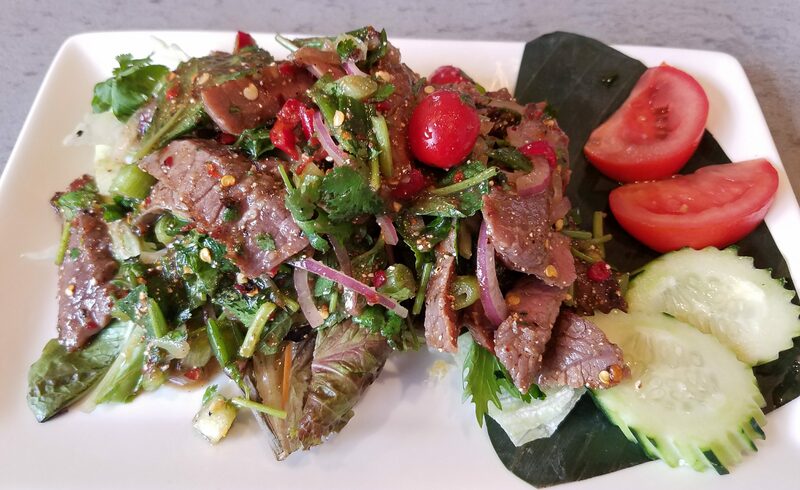 Sliced grilled beef steak tossed with onions, tomato, cucumber, roasted rice powder with Manaao chili lime dressing. Served on bed of mixed green. Sliced grilled herbal-marinated chicken on the bed of mixed vegetables, and served with sweet chili sauce. Deep fried sun drying seasoned strips of pork and served with spicy lime sauce. Stir-fried sliced marinated pork, bell pepper, chili, onion, mushroom, string bean & Thai basil. Deep-fried Tilapia, stir-fried with garlic, kaffir lime leaves, young green pepper, onion, bell pepper, jalapeno and Thai basil leaves. Steamed white fish fillet cooked in Manaao spicy lime and garlic sauce, topped with slices of lime. Pan fried tender ribs bell, pepper, kaffir lime leaves in southern-yellow-curry. Sliced marinated tender tri-tip steak with spicy basil dipping sauce. stir-fried seafood in creamy tom yum chili paste, mushroom, tomato, onion, lemon grass, galangal, bell pepper and kaffir lime leaves. deep-fried soft shell crab and stir-fried with curry powder, chili paste,egg, onion, tomato and bell pepper in coconut milk.